It is now more than 60 years since organised sailing was first undertaken on the ¼ square mile stretch of water, known as Pennington Flash, which was created by mining subsidence following the opening of Bickershaw Colliery in 1877. It was previously low-lying, poor agricultural / marshland, liable to flooding, bisected by a small stream, Plank Lane Brook, which leaves the Flash as Pennington Brook at the eastern end of the water. The water probably appeared at the turn of the century. Photograph: Tom Edmondson – Before the sailing began: the view from Pennington Brook, looking west, showing increased coal spoil tipping into the water at the eastern end, and refuse tipping in the foreground on the left. Maps published up to 1904 do not show the area flooded; one published in 1905, shows the newly-formed water, about twice the present size; bisected by the London and North Western Railway – Westleigh line from Pennington Junction to Wigan via Bickershaw; then designated ‘The Flash’. 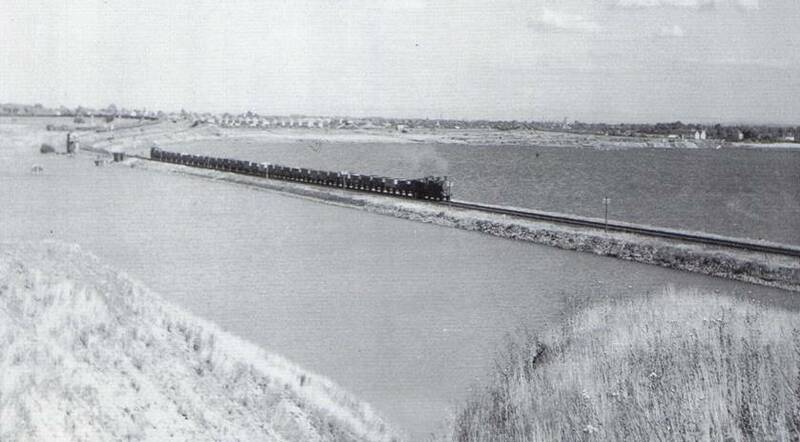 Photograph: T. Edmondson – Before the sailing began: the view from the spoil tipping, looking east towards Leigh: showing the railway line along the north side of the water, of which; only a spit of the original rail bed remains in the country park, to the north of sailing mark designated No. 4 today. In 1986, two of the three organisations sailing on the Flash amalgamated to form the present club. 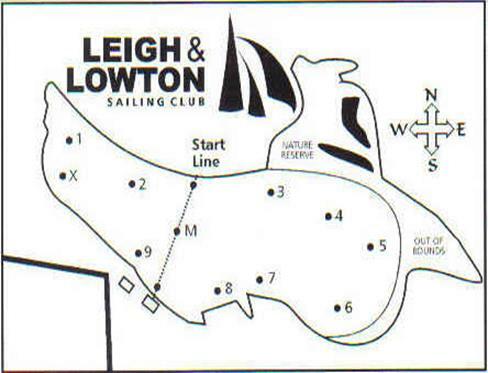 As the name implies, the two clubs which amalgamated were: Leigh Sailing Club and Lowton Sailing Club (to become: LLSC); the third club using the water was Manchester University Yacht Club. Photograph: Rodney Gregory – Access gate from the road junction: the track down to MUYC; can be seen in the background. Manchester University Yacht Club [MUYC] was located within the grounds as sub-tenants of Leigh Sailing Club, and had a separate entrance at the junction of Sandy Lane and Byrom Lane, facing Byrom Lane. In the early days, they only had a plot of land, no building, and sailed Firefly dinghies. 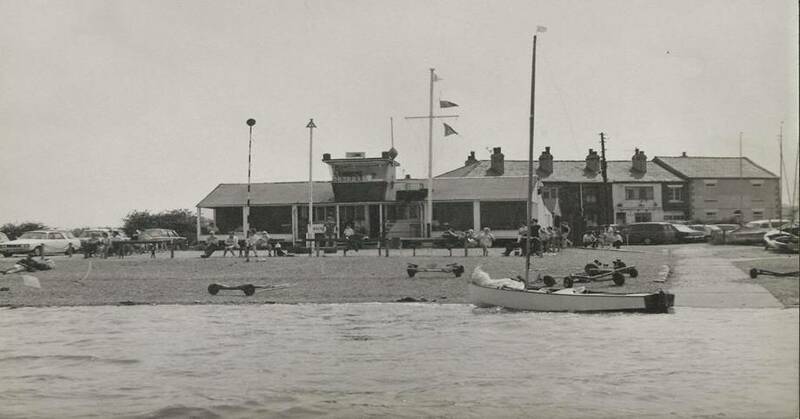 Latterly they sailed Lark dinghies, and replaced an earlier timber building with the present structure in 1964 to the west of the foreshore from LLSC; this is now the training centre for LLSC. MUYC have since re-located elsewhere. 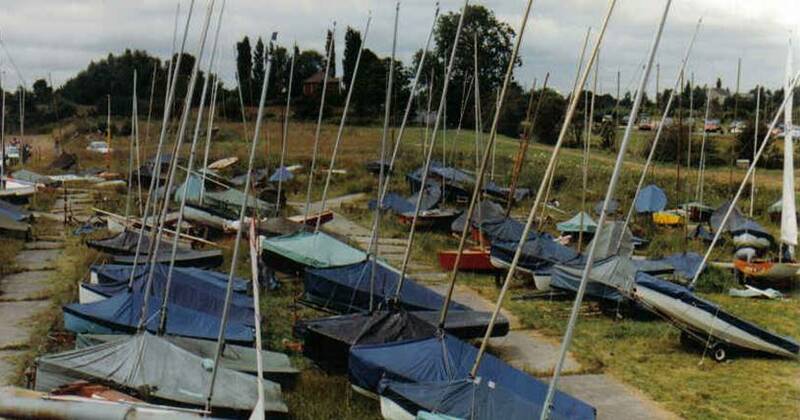 Lowton Sailing Club: began life as the National Coal Board [NCB] Sailing Club. Their clubhouse and land were to the west of the present LLSC foreshore, and was accessed from the junction of Sandy Lane and Byrom Lane facing Sandy Lane. The access point can still just about be identified within the present hedgerow. Coal mining was still a major industry in the area at the time of the establishment of sailing on Pennington Flash. The area headquarters for the NCB, Anderton House, was nearby on Newton Road, in Lowton St. Mary’s, from 1965 until it was demolished in 1989. Bickershaw Colliery was on the north side of the Flash. It was one of the major collieries in Lancashire with 4 shafts until it closed in 1992. Early photographs of sailing on the Flash generally include the spoil heaps on the far side of the water – now landscaped, and the green pithead gear at the colliery. The spoil heap abutting the water today, opposite the site of Lowton S.C., did not exist prior to 1950; tipping into the water, south of the rail link, only started in 1951. Photograph: Mark Gregory – Pithead Gear of Bickershaw Colliery can be seen above the spoil heaps. It is a well-known fact that those who sailed on the Flash in the early days were known for their ‘greyish’ sails due to discolouration from the coal dust suspension in the water, since filtered water from the colliery washery was discharged into Hey Brook, which flows into the Flash on the western side. The highly discoloured water was no doubt also quite well-polluted by seepage from the local refuse tip, as evidenced by the quick deterioration of baseball boots, and deck shoes (popular sailing footwear in the days before wet socks and boots) which soon became just a set of metal eyelets and a rubber sole, with little cloth between them! Lowton Sailing Club sailed 505s, Fireballs, GP14s, Graduates, OKs, and also had a handicap fleet. Their clubhouse was finally demolished in 2002, having been rented to Wigan Metropolitan Borough Council for a number of years for their schools’ sailing groups following the amalgamation. Photograph: Rodney Gregory – The view from Leigh S.C. race control: MUYC in the foreground; Lowton S.C. beyond. 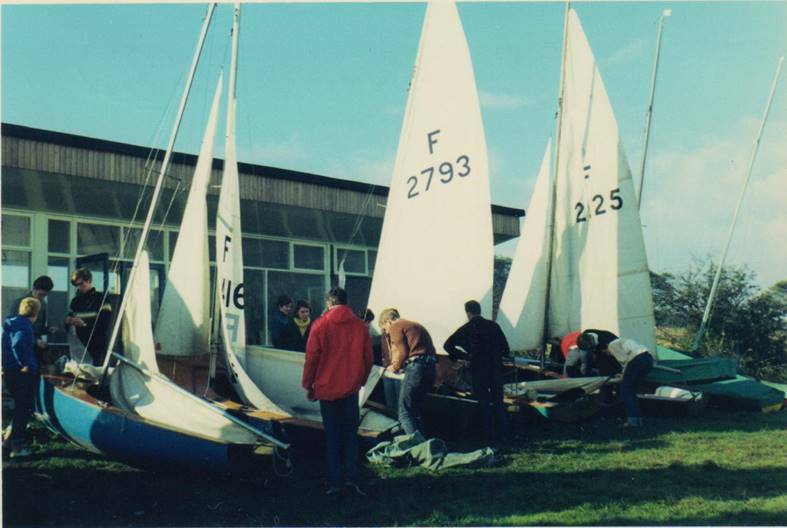 Leigh Sailing Club: began life as Pennington Sailing Club. The inaugural meeting of Pennington Sailing Club was held in Leigh Cricket Club on the 10th August 1953 when 10 people initiated the founding of the club, as ‘an organised group for the purposes of sailing boats on Pennington Flash’. The first boats to be sailed were 18ft ‘Flatties’. These were a flat-bottomed sailing boat design, peculiar to the flash. Many of the founder club members were also friends with a John Monks, the proprietor of a major funeral and coaching business in the town. It is rumoured that the said John Monks’ funeral business, was the source of wood to build these boats. The land upon which the present club stands was originally leased as from 18th August 1953 with a bid of up to £10 for the annual rent, an extended 7-year lease was negotiated in October 1954. The annual rent is shown as £25.00 in the 1959 accounts. At the first Annual General Meeting [AGM] of the newly formed sailing club held on the 1st March 1954, also in Leigh Cricket Club, it was originally proposed that the club‘s burgee should disclose a blue star on a white field. This was amended to a black star which is taken from the Leigh Borough coat of arms; registered in 1899. Leigh Borough was formed from an amalgamation of 4 townships: namely, Bedford, Pennington, Atherton and Westleigh, each being represented on the shield within the coat of arms. Pennington’s quartering is represented by a black 5-pointed star on a white background. This is based upon the 3-star coat of arms of the Bradshaw family, who became chief landowners of the manor of Pennington in 1312, and held it until 1703. Bradshawgate, the main Leigh town centre shopping centre thoroughfare, commemorates this family name. It was also agreed at this first annual meeting of Pennington Sailing Club, that fees and subscriptions for the club shall be: entrance fee [family] £10.50 or a reduced fee of £2.10 [2 guineas] for boats approved by the General and Sailing Committees; annual subscription £1.50. Equivalent values in 2015: £270, £54 and £38.50. Pennington Sailing Club participated in the local Hobbies and Handicraft Exhibition, held 5th – 9th October 1954 in the Co-operative Hall, Leigh, hosting a stand exhibiting a Graduate dinghy. They protested in their program presentation about the continued large scale tipping of household and industrial refuse into the southwest corner of the flash by Leigh Borough Council. This heap of rubbish was regularly attended by the local fire brigade following outbreaks of spontaneous combustion. With the wind in the right direction (easterly) the sailing club would be engulfed in smoke. Photograph: Bernard Mattison – Sailing in the late 1960s with the smouldering refuse tip in the background. During 1954 and 1955 all sailing on the Flash was conducted from the field leased by Pennington Sailing Club, the only facilities being a cold water tap at the top of the field installed at a cost of £17.00 by members of the now-named Lowton Sailing Club, who shared the use of the land; Pennington members were asked to pay half of the cost. 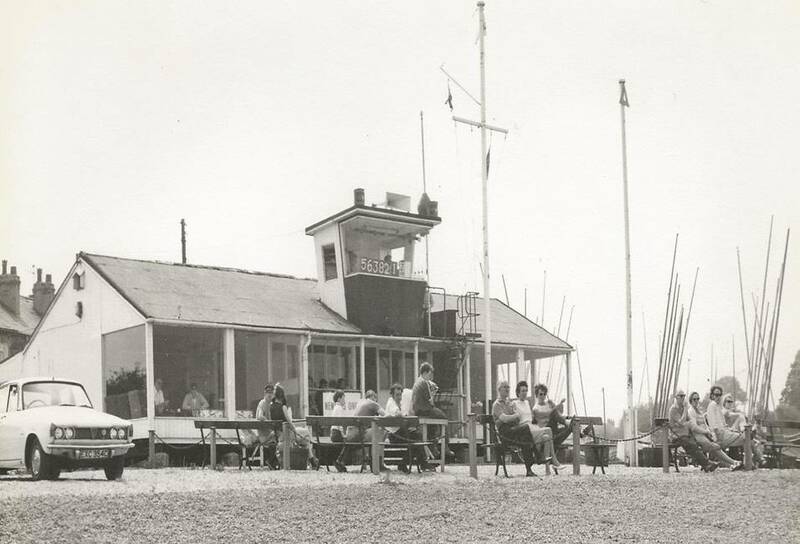 During 1956, Pennington Sailing Club acquired a clubhouse – a second hand, wholly constructed timber built, black and white-painted pavilion, complete with veranda, from Leigh Cricket Club. It was erected on brick pillars closer to the water’s edge than the present building. The rescue launch boathouse was later erected at the rear of this extended building, and there still remained sufficient clearance to the boundary fence to allow vehicular access to the rear of both structures. Due to constant water encroachment caused by increased water levels, partially due to a weir inserted under Pennington Bridge in about 1951, and local subsidence, the original clubhouse was uplifted in 1968, the foreshore fortified, and the building moved backwards towards the perimeter fence, on to new brick pillar supports, close to where the present clubhouse stands today. All costs were borne by the NCB. Evidence of the final position of the original clubhouse can still be seen today; approximately 12ft [3.5M] in front of the present building are the concrete foundations for two of the brick pillars which were either side of the main front entrance to the original clubhouse. Photograph: Bernard Mattison – The original Pennington / Leigh S.C.: before the move towards the boundary, and the lounge extension. The rescue boathouse can just be identified at the rear on the right hand side. The first block membership offered by the club to an outside organisation, was offered to the Thomas Lineacre School of Wigan, in January 1956, and the first organised club race programme was drawn up; races being held at: 3.00 p.m., 4.00 p.m. & 5.30 p.m. on Saturdays & Sundays – all handicap races. 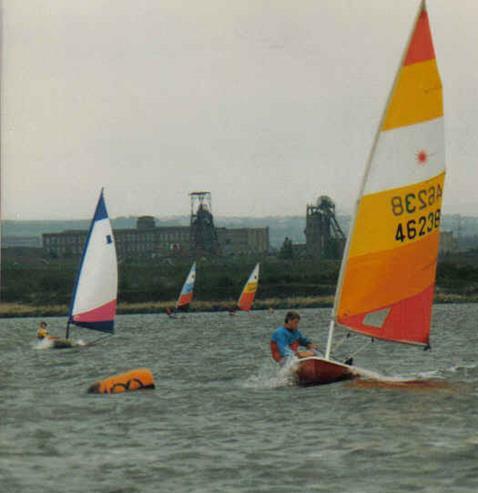 The first open meeting was held on 27th May 1956; invitations had been sent to Bolton, Hollingworth, Coombes and Fiddlers Ferry Sailing Clubs.1956 saw the first attempts to establish a single sailing centre on the flash. 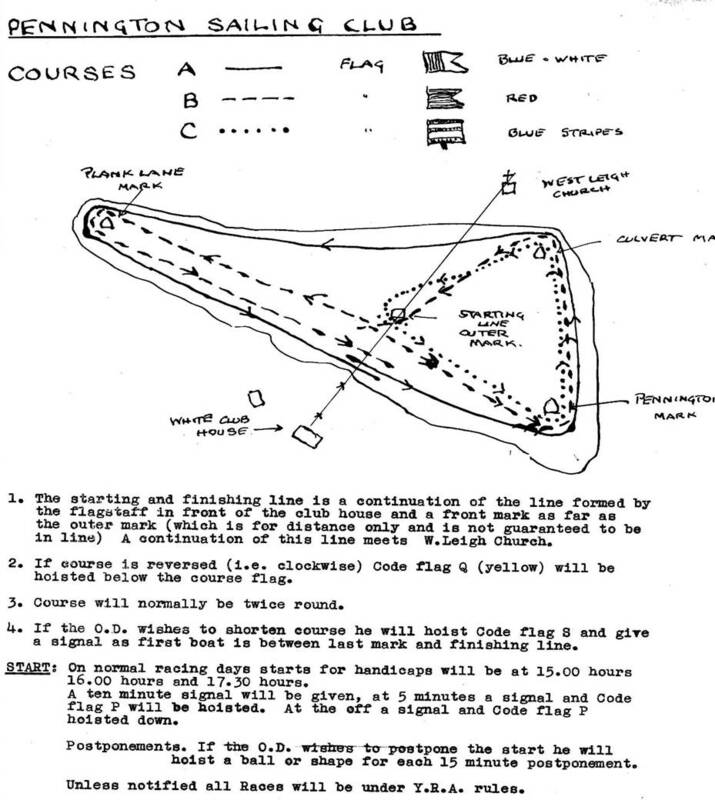 During the year, negotiations took place between the committee and the NCB / Lowton group, culminating in an extraordinary meeting of Pennington Sailing Club on the 11th October 1956, when a proposal to amalgamate all users was defeated by 29 votes to 11. Thereafter the NCB / Lowton members purchased the adjacent field along the shoreline to the west of the Pennington Group and established Lowton Sailing Club in 1957, as a separate organisation. It would take another 30 years before sailing on Pennington Flash was amalgamated into the organisation it is today. At the same meeting in 1956, the name of the club was formally changed from Pennington Sailing Club to Leigh Sailing Club. Before the end of the year, Leigh members had agreed to organise class racing, as well as handicap racing for the 1957 season. The adopted classes selected were: News Chronicle Enterprise, Yachting World G.P.14, Heron and National Firefly, later replaced by the International Cadet. In addition, an extension to the newly-acquired clubhouse was undertaken at a cost of £209, over the early spring, to provide changing facilities. This was a wooden ‘lean to’ across the rear of the building for ladies’ and gents’ changing; initially without toilets, heating and showers – no wetsuits then! The flooring of the extension was wooden duckboards on an asphalt floor. 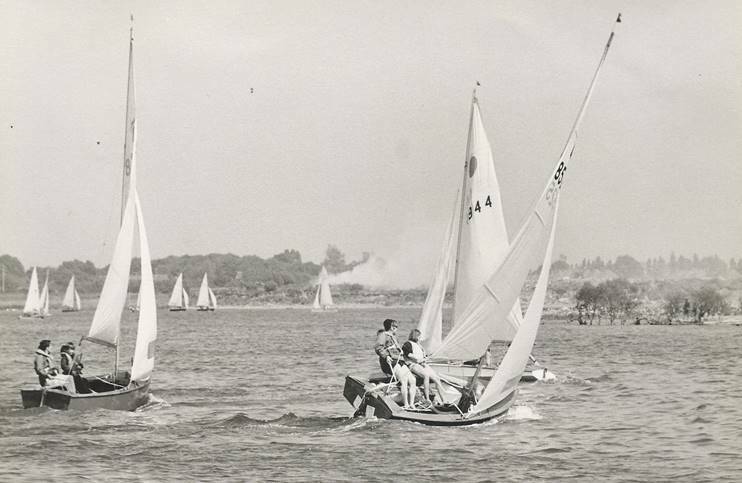 1957 was the first full season in the life of Leigh Sailing Club. The opening season regatta was held on Easter Sunday, 21st April 1957, and honoured by the presence of the Mayor of Leigh. It was by all accounts; a ‘wet and soul destroying day’: constant rain and little wind. 17 boats competed: 1 Cadet, 4 Enterprises, 1 Flattie, 10 G.P.14s, and 1 National Firefly. 2 races were sailed with handicap adjusted times aggregated. Winner: Mr. H. Baron (first commodore of Pennington Sailing Club) in his Flattie “Dorothy”. The first Annual General Meeting of Leigh S.C had been held on 13th January 1957, with an Extraordinary Meeting on 11th May 1957. The clubhouse was but a shell at the start of the season; three sub-committees were formed: Sailing, House and Works. During the first half of the year water pipes were laid, chairs purchased, a sink and geyser installed and lighting provided. Membership was temporarily closed in May 1957, because “the clubhouse is too cramped”, until such time as an extension could be provided when funds permitted. Class Captains were elected for Enterprise, G.P.14 and Heron classes, and RYA affiliation granted. A berthing plan was initiated; berths being allocated according to seniority of membership – seniors nearest to both clubhouse and shoreline! The club had no rescue facilities; during the year the purchase of a suitable boat was authorised for a sum not exceeding £150.00. In the event, a timber, clinker-built launch was purchased from the Admiralty; a sum of £65.00 appears in the accounts for 1957. Following fitting out, and named ‘Picaroon’ (pirate) it was later insured for the sum of £100. This was subsequently replaced by a GRP launch about 1970, also named ‘Picaroon’. At the beginning of May 1957, there were 68 boats in the club and considerable time and effort was spent by the Main Committee discussing four alternative forms of Constitution, and on the 11th May 1957, an Extraordinary General Meeting was held, at which the first draft was adopted. It formed the basis of the club Constitution for the life of Leigh Sailing Club, upon which the present amalgamated club is also based. The first Open Meetings were held during 1957. An Enterprise open meeting attracted nine boats: eight from Leigh and one from Lowton. The Northern Heron Championships was held on the Flash, and the G.P. 14 Class, also hosted an open meeting. Pennington Flash was beginning to earn a reputation as one of the best pieces of sailing water in the northwest of England – there were few trees around the shoreline then, which created a large expanse of water with ‘true’ winds. As the open meeting attendances increased and the Sailing Committee sought to improve the quality of sailing provided to visiting dinghy sailors, the acquisition of a rescue launch enabled water-based starts to be conducted for Open Meetings. There were no ‘air horns’ available then, so the required sound signals, prescribed by the RYA to call attention to flag signals, were made from the committee boat by an individual standing in the launch, using a pump-action 12 bore shotgun, capable of holding up to six ‘starting’ cartridges, to make the appropriate number of shots: one, two or three in accordance with the flag signal requirement. Eventually, someone was hit by a wad from a fired shot, and had to be taken to hospital. Later, a mechanical device was made, which was hung over the side of the launch, and enabled the 12 bore cartridges to be discharged towards the water. The Cadet Class was ‘adopted’ later in the year; by the end of 1957 there were: five Cadets, 28 Enterprises, 27 G.P. 14s, 10 Herons and 11 miscellaneous boats registered with the club. The club then comprised: 156 full members, 52 associate members and five junior members. 1957 also marks the inauguration of a Club magazine: ‘Leigh Flash’ – later to become: ‘Flash Point’. Vol.1 No.1 was issued May 1957 comprising three articles and the full racing results for the opening regatta, and series races to 6th May. The first edition was issued ‘free’, further monthly issues until end of 1957 – 4s. 0d. (20p) each. The final race of the season was ‘Thunderbolt’s Gallon’ on 5th October 1957. A second AGM was held on 27th October for the year ending 30th September 1957. Membership at this time was limited to 80 Class boats. Informal club dances have been held as fund raising events since 1956. An Annual Children’s Christmas Party is first documented for 21st December 1958, with a formal Annual Dance in March 1959. Subscriptions remained at £1.50 for 1958, but were increased to £2.10 for 1959. At the 1959 AGM, a rule of membership was introduced that permitted the Committee to “request any Member to remove his boat from the Club premises if such Member does not sail at the Club in at least 20 races between the days 1st March and 31st October”; an appeal procedure was also contained within this rule. Boat berth spaces were now at a premium. By this time, the club had become very much a ‘class’-based racing club, limiting membership to only those with boats belonging to the class designs adopted by the club to sail on the water. Whilst there was still handicap racing on selected ‘trophy days’ and for the ‘open’ winter sailing, there was no handicap fleet at Leigh S.C. at this time. Only Lowton S.C. ran a handicap fleet. Handicap fleet racing did not return to Leigh S.C. until the introduction of a development fleet in 1980. Photograph: Bernard Mattison – Race control box with sequence lights across the top. Home computers did not appear until 1980. Leigh were fortunate to have a member, Mr. K. Haynes, who in the early 1960s made and donated an electro-mechanical timing mechanism for automated starting of the class racing; previously just flags and a stop watch were used. Bright coloured spotlights, which can just be identified in pictures of the original clubhouse prior to the move in 1968, were mounted across the top of the race control box, in full view of the fixed start / finish line. A card containing slotted holes was drawn over switches, by a motorised device, which sequenced the lights ‘on’ and ‘off’, to give coded signals in turn for the starting procedure for each fleet. This device was in use for the best part of 20 years before being updated with a computerised version before the old clubhouse was demolished and replaced. A similar updated automated system is still used for race control today. By 1967, annual subscriptions (due 1st October) had increased to £3.75, with a rebate of 60p for early payment before 30th November. Also by this time, the International Cadet Class had been replaced by the OK Class, though not without controversy, since at the 1966 AGM a limit of not more than one fifth of the total number of boats had been imposed on the number of single-handed boats permitted. The OK remained a recognised Class until 1971, when replaced in 1972 by the Mirror dinghy; the Miracle dinghy was added to the fleet in 1978, the Topper introduced in 1981, and finally the Heron was withdrawn from the fleet list in 1985. In the beginning, the sailing season began over the Easter weekend, starting on Good Friday with a pursuit race: for an RNLI Pennant, and finishing on the last Saturday in October with Thunderbolt’s Gallon. The Revett Trophy series of races was introduced in November / December during the late 1950s. Initially limited to Leigh members, the series was opened to visitors in 1968. Later in the early 1960s the Tipsy Trophy was introduced beginning 1st / 2nd weekend of March through to Easter, also limited to Leigh members until 1972. 1971 saw the introduction of the Icicle Series in January & February as an ‘open’ event from the start. By now everyone had wetsuits. In 1982, the Icicle & Tipsy Series were amalgamated and renamed; the Tipsy Icicle running from January through to the end of March. Increased co-operation between the two sailing clubs saw the introduction of the ‘Pennington Pot’ trophy as an individual open handicap competition by members of both Leigh and Lowton clubs in 1984. The only other joint trophy: the ‘Leigh / Lowton Rose Bowl’ was a team pursuit race between the two clubs, which started in 1971 awarded to the winning club. With the increased use of the club during the winter, the toilets and changing facilities across the rear of the clubhouse were totally inadequate. The club, with the aid of a Sports Council Grant, added the brick built gents’ changing room and showers to the timber building in 1977. This changing room still stands today, though extended in 1980 to include a ladies’ changing facility, galley, bar and bar store which have all since been upgraded after the new building was erected, and now form part of the present structure. The timber-built clubhouse was demolished on 5th June 1983 and replaced by the present steel framed structure. The new building was erected that October; the floor was laid in November, enabling the A.G.M. to be held in the new building on the 18th December. Fitting out was mostly completed by the members over the winter which made the club adequately functional to host an R.Y.A. training weekend over 4th – 5th February 1984. The original access to Leigh Sailing Club was off Green Lane, to the left of the electricity distribution pylon, and before the beginning of Wilton Cottages. It is rumoured that a Merlin Rocket boat owner had transported his boat from home, with the mast stepped, forgetting the overhead lines, which destroyed his mast and damaged the boat when the metal mast hit the power lines. A club Bye Law was subsequently introduced prohibiting the rigging of any boat in the vicinity of the entrance to the dinghy park. Of the classes sailed at Leigh S.C. in the mid-1960s, only Merlin Rockets had metal masts; all other classes still had wooden masts. The flooding in October 2012 is not a recent phenomenon; as stated earlier, the original clubhouse was moved in 1968 due to constant encroachment of water to the front entrance access to the building. 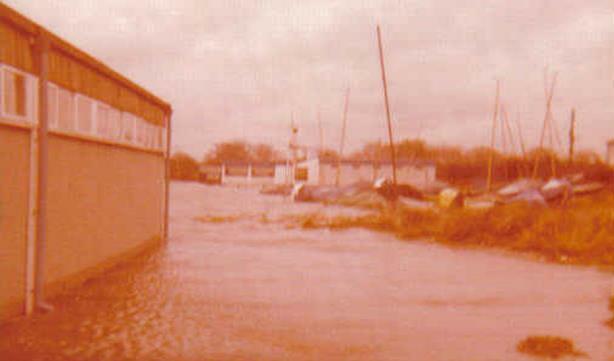 There was also serious flooding in 1979 – up to and beyond the present gents’ changing facility, and totally surrounding the timber boathouse. Photograph: Ken Nicholls – Construction of the present clubhouse in 1983. Earlier gents’ changing facility to the right, and remnants of the old lounge on the left: retained for interim race control centre / office. LLSC is still growing today. The latest addition to the new building constructed in the winter of 1983 / 4 is an extension to the east side of the main building increasing the floor area by 30% in 2012. Some of the founder Members of Pennington / Leigh Sailing Club………………..
Sidney Revett, was the first Hon. Secretary of Pennington Sailing Club, Commodore 1956 – 1957, Club Trustee, and sailed G.P. 1289. He donated the ‘Revett Trophy’ for the Frostbite Handicap Series of races in November / December; which is still part of the racing calendar for the present LLSC. Mr Revett left the area in the 1960s, to become Secretary of The Royal Northern & Clyde Yacht Club, Rhu, Helensburgh, Scotland. Max Stothert: Commodore 1955 – 1956, Club Trustee, first Club Measurer (all classes), and was also owner of Stotherts: bottlers of mineral waters and soft drinks, in North Road, Atherton, later bought out for their technology by A.C. Barr (famous today for Irn Bru) in 1967. Stotherts were one of the first companies in the UK to manufacture drinks in the now familiar ‘ring pull’ cans. Manufacturing continued in North Road, until the works closed in 2006. Jack Staveley: was Commodore 1957 – 1958, Club Trustee, and sailed G.P. 1402; previously sailed a Flattie named ‘Thunderbolt’. In October 1957, Mr. Staveley donated a prize for the first ever pursuit race sailed at the club on 5th October: ‘Thunderbolt’s Gallon’ – a gallon of ale. Later this was replaced by a silver cup, sailed for on the last Saturday in October, which was also the end of season dance and prize giving. Tradition was that the winner shall fill and replenish the cup with rum, and pass around all who competed. Later a further cup was donated to club: the ‘Staveley Trophy’, presented to the winner of the Merlin Rocket Class – Open Meeting. Harold Cragg, was first Honorary Secretary of the newly named Leigh Sailing Club in 1957, Commodore in 1961 – 1962, and a Trustee in 1974. He also founded Leigh Dinghy Stores: a major retail and mail order chandlery of its time, which grew into a very well-known business within the sailing fraternity. Boat fittings, sailing clothing and masts were despatched world-wide from a store initially based in Vernon Street, in the town centre, before moving out to 215 – 221, Chapel Street, Leigh – the most unlikely place to expect to find a yacht chandler. The business was sold on in 1982, and now no longer exists. Harold Cragg died whilst sailing at sea, in a boating accident off Cape Town, South Africa in 1993. 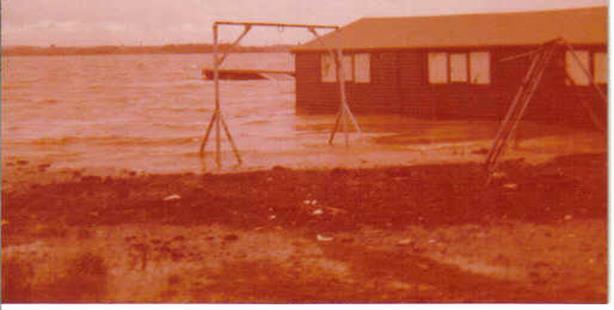 The PFA was formed on 28th January 1969 to enable the three Sailing Clubs, and later on maybe others, to speak with a single voice in matters relating to the use of Pennington Flash. The inaugural meeting, held at Leigh Sailing Club, was chaired by Mr. J. D. Stott of Leigh Sailing Club, Mr R. St. G. Harper of MUYC (who was elected Hon. Chairman), and Mr. G. Rothwell of Lowton Sailing Club: Hon Secretary, on a temporary basis which actually lasted beyond 1984! A constitution had been drafted at two preliminary meetings of the three Clubs. The drafted constitution was reviewed and agreed at this meeting. The events which initiated the formation of this user group were notices served on the three clubs by the Leigh Corporation for the purpose of raising the water rent. In 1974, the Leigh Ornithological Society and Anglers Association were co-opted into the PFA, to enable discussions between the enlarged groups of Pennington Flash users, in particular winter sailing restrictions to accommodate the increased waterborne wildlife from 1st November to 1st March. A series of meetings was later held with representatives of Pennington Flash Country Park prior to and after the official opening of the Country Park on 15th April 1981. The last known recorded meetings for the PFA were in February and March 1984 with the Pennington Park Joint Committee when the issue of public sailing on Pennington Flash was discussed. 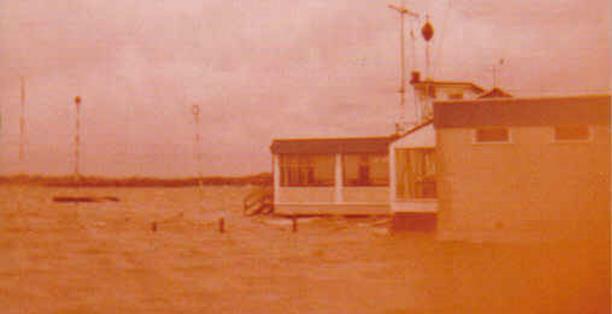 1978 was the 25th Anniversary of the founding of Pennington / Leigh Sailing Club. A Celebration party comprising barbeque, and entertainment by an outdoor ‘steel band’ was held to commemorate this event. All available Past Commodores were invited; most attended. It was a beautiful warm evening, there was no breeze, so the water was almost ‘as flat as a mirror’, and as good a reflector of the sound output from the steel band. As the evening came to a close, the celebration was attended by the local constabulary! Complaints about the music had been made by residents over ½ a mile away, across the water, beyond the spoil heaps. The author has lived in Pennington; within 10 minutes’ walking distance of Pennington Flash from 1943 to the time of writing this article: February 2015. Started sailing in April 1961 at Southport Marine Lake, and later, as a member of Southport Sailing Club, having previously enquired at Leigh, but unable to comply with the 20 race rule! Started work at Leigh Dinghy Stores January 1965, progressing to store manager before leaving 1st November 1974. Joined Leigh Sailing Club March 1965, and still a member. Sailed mainly Enterprise & G.P. 14 dinghies; was Commodore 1977 – 1978, and actively sailed until 1991. In writing a history like this, an author often receives snippets of information and photographs from fellow members. All are most gratefully received. In particular, I would like to thank Mr. J. Sumner, who entrusted me with some of the early documentation from Pennington and Leigh Sailing Clubs, and the earlier writings: ‘History of Leigh Sailing Club’ by Jim Sumner in the issues of ‘Flash Point’ October 1978, February 1979, and October 1979. Thanks are also due to: Mr. John Stott jnr. ; Mr. Martin Stott, for the black and white photographs – courtesy of Mr. Bernard Mattison; Mr. D. Battye, MUYC Commodore 1968; Roy Thomason and Ken Nicholls, Leigh Sailing Club. Finally, thanks to Ruth Lainton Gregory, who assisted in editing and proofreading this snapshot of local history. The use of St. Peter’s Church, Westleigh, with its pyramidal roof tower as a ‘line marker’ for the start and finish, had to be abandoned due to the fact that the coal spoil was tipped so high that it was completely hidden. In subsequent years, the subsidence revealed most of the church until the spoil was further increased. Further subsidence and coal spoil removal for development of the country park has once more revealed the view of the church, though it is hidden today when the trees are in leaf. It can normally still be seen from the clubhouse during the winter months when the leaves are shed. Note: Reference to the railway at the top of the diagram: highlighting the track which used to run along the Flash shoreline to Bickershaw Colliery. Some of the track bed still remains, as the shingle spit between Pennington Flash and Ramsdale’s Flash; adjacent to what is now known as No. 4 mark. Photograph: Mark Gregory – In the background: Parsonage Colliery which closed in 1992, and Victoria Mills (Hayes Mills) which closed in 1991. Both later demolished. Now: Parsonage Retail Park. Flooding was round to the rear of the timber boat house now replaced by the present building. The original jetty in the background still existed until late 2015. Access to the front of the original clubhouse totally cut off. Also shows the extended lounge and new gents’ changing facility. We are keen to receive any contributions from members who would like to add to this account of the history of the club – please make contact with the sailing manager with any input.